I wrote the following on February 15th after reading Pat Conroy's announcement that he had been diagnosed with pancreatic cancer. No author has touched me in ways this man has. Don Barley has never hesitated in saying yes whenever I've said "Pat Conroy is going to be (insert the name of any city you want), can we go?" Pat Conroy has influenced many with his writing, he meets and greets every person standing in a line to have a book signed as an old friend and has a laugh and/or a kind word for each and every one. I have written about him often over the years at my Meanderings and Muses and have posted many pictures I've been lucky enough to have had taken standing by his side. He's listened to me babble about how much I love him. He's wished me happy birthday. When I told him I had written a novel, he asked if I had brought him a copy. I had not, but found a copy in the bookstore we were in in Charlotte, NC. When I gave it to him he asked me to sign it. Me. Signing a novel I had written to give to Pat Conroy. You kidding me?! WHAT a rush. I want lots more opportunities to have all these things happen again. I hope you'll join me in sending Mr. Conroy prayers. If you don't pray, join me in sending good thoughts. Like he says, he owes us a book and he wants to deliver. I think he still owes us several, and I think he can deliver." This larger than life man, favored son of the south, cherished author and storyteller unparalleled, lost his battle with pancreatic cancer and left a hole in the world. And I can't even imagine. No more books from Pat Conroy? No more poetic, emotionally lyrical words written as no other person could ever come close to writing them? Bless his heart. Mr. Eder missed the whole point of Pat Conroy. Those things he scoffed at? Those were the things Pat Conroy fans wanted, loved, needed more of. Waited years for. Those might have been things any other writer could never get away with, but those things kept this fan, along with so many others, tapping her toe in constant impatient hope of the next Conroy book. Fiction or non-fiction. It didn't matter. Just feed my fix with Conroy words and style. "Talk too much?!" Ha! Conroy dialogue is magic. No one will ever match his ease of dialogue. No one. There should be an art form named "Conroy-esque Dialogue." Except the only artist who would make it into that esteemed category would be Donald Patrick "Pat" Conroy. I could go on like this forever. How his words about the lowcountry marshes transport you right there. Have you smelling the marsh, feeling the hot heavy southern air. I could point out a dozen passages from his books where he writes about food that would leave you tasting the briny sweet salty taste of the lowcountry south. Would have you wishing for the next bite. But. We'll have no more. No more occasions of settling into my favorite red chair with my coffee or a glass of wine opening that brand new Pat Conroy book. No more occasions of laughing out loud or weeping tears onto the pages. No more drives to wherever his next signing might be. No more hugs, "How you been?" Teasing, smiling joy of just being in the orbit of Pat Conroy and his zest for people, and for life. I am grateful beyond words for the opportunities I had to say "Thank You" to Pat Conroy for what he gave me. Gave all of us. Oh, how I will grieve for the words he was unable to give us by being called home much too soon. But - he left us this. A testament of how very much he loved us. His readers. Enjoy this little snippet of Mr. Conroy talking to us with a grand unaffected fullness from his heart - the only way he knew how to communicate. Excerpt From Seltzer Panel from USCB on Vimeo. “He was a coach, a teacher and a well-loved man. And it is enough, Lord. It is enough.” as said by Tom Wingo in Prince of Tides. So, Dear Reds. Were you a fan? Did you have a favorite Pat Conroy book - fiction or non-fiction? A Pat Conroy story you'd care to share? What wonderful memories, Kaye. We readers are fortunate to still have his books; Pat Conroy will be missed. Oh, Kaye, I've been thinking about Pat Conroy ever since I saw that he'd died. When I was in Beaufort SC a few weeks ago researching my new book his name came up over and over and over in conversation (after did I know Forrest Gump was filmed there) as a much beloved home town boy ... not legend, but real person genuine human being generous soul and fantastic writer. We should all die to such adulation. He earned it. Anyone, what's your favorite book of his? Thank you for this tribute to one of my favorite authors. He was an artist with words, writing with the deep passion with which he led his life. Prince of Tides - simply stunning. I also loved his book about books: My Reading Life. If you haven't read it, you must. This man loved books. He loved words. And he writes about that love so beautifully. Rest in Peace, Mr. Conroy. Well put, Kaye! I was stunned when I heard the news, hoping he could fight off the cancer for at least a while longer. So sad, especially since (according to news reports), he'd made such strides in his personal health. I'll miss his writing, but what a wonderful legacy he left behind. I did love his work and was so sad to hear the news that he had left this life. I'll think of him looking down on us and cheering on all the other writers out there who will be telling their stories, just like he did. And my favorite still is the first book of his that I read many years ago, THE PRINCE OF TIDES. Such a good book. Kaye, what wonderful memories you will have of him! My youngest daughter is also heartbroken, Kaye. For equally personal reasons. When our girls were in high school they each read Conroy's Lords of Discipline, about his life at The Citadel, the South Carolina Military College. (That's right, none of my daughters are what you would call frilly.) Holly, who was also in Civil Air Patrol (which is a volunteer auxiliary of the Air Force, and under the Patriot Act, in case you didn't know), and would graduate high school with a rank equal to a junior officer in the Air Force. So she always knew she wanted to be involved in service in some way. She was nominated to the Air Force Academy by our local Representative, who was Rob Portman at the time. I should also mention that we were at war in Iraq just then. She applied to The Citadel, and was invited to come interview, then was offered a full, four-year scholarship, complete with tuition, room & board, uniforms, books, even haircuts. The letter accompanying her scholarship offer came from none other than Pat Conroy himself. Since the military college did not require six years of service, unlike the Academy, it was an easy choice to accept, especially since it was her first choice. Several years later, when Holly was a student officer at school, she was to meet Mr. Conroy at a fundraising function, and she saw him at least one other time. I myself never had the privilege, alas. Holly ended up getting her undergrad there, only the 171st woman to do so. She then went on to get a four-year ride for her PhD in Microbiology, largely on the strength of her undergrad experiences. The discipline she learned at a military college served her well, and she acquired her doctorate two months after she turned 26. And she had a job offer midway through her last year. Thank you, Pat Conroy, and may you rest in peace. Kaye, I've heard nothing about his wife, novelist Cassandra King. Do you know her, as well? I only heard him once, at the Southern Festival of Books a couple years ago. And, he was marvelous. Would you believe it was The Water is Wide that I remember? I read it when I was in high school, still thinking I might be a teacher some day (thank heavens I found my true role!). And, I found that book so moving. Most of all, Kaye, when I think of Pat Conroy I think of you and my friend, Donna. Both of you are passionate about him and his books, and he was your favorite author. And, I my heart goes out to both of you. Hugs, Kaye. Kaye, Thank you so much for this tribute. I love Pat Conroy. "The Great Santini" was a book that changed my life; it told me that I was not alone in the world, an eldest child of a hard-drinking bully of an ex-marine. I can't even begin to explain how each sentence both stirred and comforted me. I have read all the books. And will read them all again. Oh, Denise. I wonder a lot if Pat Conroy truly, TRULY, knew to what extent he had helped others. He said he did, and I believe he did at some level. But truly?? I just don't know. His father was with him at a signing we went to in Atlanta many years ago. He was sitting at a table also signing books. I remember my Donald asking if I wanted to have him sign my book and I said no. Pat and his dad may have made amends by that time and I was glad for that, but I was never so gracious nor generous. Sad to hear that Pat Conry has gone on ahead. Too soon. Too many people with way too many things still to share have passed recently. I never met the man, but his books are wonderful. One nice thing about artists though. Even after they die, they often leave behind such a legacy. Those of us who were only "fans" can hear their voices again, any time we like, simply by opening their books, cueing up their records, rewatching their movies etc. Need to get to re-reading. Cindy, I agree. The legacy will live and we as fans are so lucky in that. I too find it a comfort. I've mentioned here before how I keep a copy of the Pat Conroy Cookbook on my nightstand. That sounds ridiculous, I know. But - it is way more than a cookbook. It's full of some lovely essays as well. But too, I'm one of the weird souls who also enjoys reading cookbooks almost as if they're novels. Believe it or not - I'm not the only one. I know a couple other oddballs who do the same thing. Mornin', all - Cam you believe it's 9:30, and I've only just gotten up!?! I stayed up way past my bedtime reading last night and now feeling like a total slug sleeping this late. Hallie, I was dying to know if you bumped into either Pat or his wife Cassandra while you were in Beaufort. It's a fairly small town (isn't it gorgeous??) and they are, apparently, out and about a lot. I did not, however, realize at the time that he was as ill as he was. Lucy, Donald and I had tickets to attend the 70th birthday celebration. Sadly, we had to cancel and I will forever regret that we weren't able to go. Claudia, his book about books is a gem, isn't it?! I was a lucky recipient of an arc of that book and walked around with it like I had discovered the Holy Grail. I too recommend it highly. Elizabeth, I felt the same way. The irony of him making this decision to take better care of himself is one of those things that can make a person like me cuss up a storm. Kay, one of the things I admired most about Pat Conroy was a statement I read a long time ago no writer ever need worry about Pat Conroy slamming their work 'cause it would never, ever happen. So classy. Karen, what a lovely story!! I only met Cassandra King once. She and Pat shared a signing event at Park Road Books in Charlotte. Because Cassandra and I have a mutual friend she was expecting to see me there and welcomed me with open arms like we were best pals. She's adorable and gracious and funny. She was signing Moonrise, which is my favorite of all her books. I don't mean to give the impression that Pat Conroy "knew" me. I was only one of a beezillion fans that followed him. I did joke with him that I had quite possibly been stalking him a little longer than some. He sometimes recognized me, but that was the extent of our "friendship." He did greet Donald, however, with a "Hey, you. You still hanging around with this woman?" when he saw him in Charlotte and got up to shake his hand. Lesa, The Water is Wide is one of those books that, I think, should be required reading. Sadly, SO sadly, many of the conditions that he faced while teaching those children still exist in that area. Can you believe that?! Makes me SO angry. (sending you a hug, sweetie). So where should I start? Recommend a novel and a non-fiction book for me, please, Kaye--and all you other Pat Conroy fans, too. What a lovely tribute, Kaye. I was so saddened to read of Mr. Conroy's passing. He was a great writer. Don't think there can be any argument about that...but more, he was a great gentleman and a gentle man. Rest in Peace. Thank you so much, Kait. I agree, a gentle man in the truest and best sense. I loved The Lords of Discipline and The Great Santini, but I was moved most of all by The Water is Wide. He revealed much of himself in his fiction, but his memoir about that one year of teaching in a place the rest of America didn't know existed revealed his innocent hope that all is fair in America, that a young person with energy and an open mind can reach people different from himself, and that even when your best efforts seem to fail, if you touch one person, you succeed. He didn't remain a teacher in the traditional sense of teaching in schools, but he taught through his writing instead. His loss is painful but he left a huge legacy. Ramona, Hey You! Thank you. Your mention of The Water is Wide reminded me of something. I only learned this recently, but a former student of his from back then, Sallie Ann Robinson, is now a successful author of cookbooks. She was one of the presenters at his recent 70th birthday celebration. He held on to folks. I love that. Admired Mr. Conroy very much. Thought of you immediately when I read of his passing.He certainly was a writer and person whose loss touches many. Lil, hi!! We've missed you! I so agree - I think he will be missed by many and quite deeply. What a moment that must have been-- signing your book for him! Wow! I share your deep affection for him. My closest friend from college was a good friend of his, and she is devastated. When we were 20 back in '75 before she knew him the two of us went to a writer's conference in Atlanta. We attended a small seminar given by Adrienne Rich. There was only one guy in the group. Adrienne was entering her angry feminist stage, and she asked the guy to leave. She told us that when she agreed to do the seminar she agreed under the terms that the seminar be women-only. But that wasn't in the literature, and the guy argued that point. I remember being torn because I was a feminist but since he hadn't been notified, I thought the guy should be allowed to stay. He was sitting right next to me, and we talked about it. I liked him, he seemed charming and well-mannered, a little chubby and preppy. Ultimately, sensing her intractability, he nicely agreed to leave, but as he tried to go, the door wouldn't open. Adrienne thought he was doing it deliberately. He was momentarily mortified and I felt bad for him, but he finally got it open and left. Years later, when my friend knew him, she was at dinner one night in Savannah with Pat and another writer, and he told this story. Of course she said, "That was YOU? I was there with my friend..." and they had a good laugh about it. Over the years I read all of his books of course and heard wonderful stories from my friend about their friendship, but I never met him again. I am so pleased that you love the stories in his cookbook too. When I worked at Harcourt Brace Jovanovich bookstore in NY in the late 70s-early 80s, Julian Bach came in nearly every day with authors he had taken to lunch to see their books on display (we got a call in the morning and knew where to place them so he could sweep in and show them their books). I was delighted to read Pat's piece about Julian in the cookbook. My mystery series is set in a cookbook store, and it was important to me to include Pat in Cinnamon Girl, which quoted treasured cookbooks in chapter openers. What delightful stories these are, Valerie! and now I'm going to look for Cinnamon Girl. I love this, Kaye. Beautiful tribute. Thank you for a great reading treat. My Pat Conroy favorite was The Great Santini. It helped me find reconciliation. Later on it helped me be a better parent. My mother introduced me to his books. And Valerie Horowitz, thanks for the great story. Beautiful tribute, Kaye! It sounds like you had such lovely meetings. I'm so sorry that I wasn't able to post until tonight. 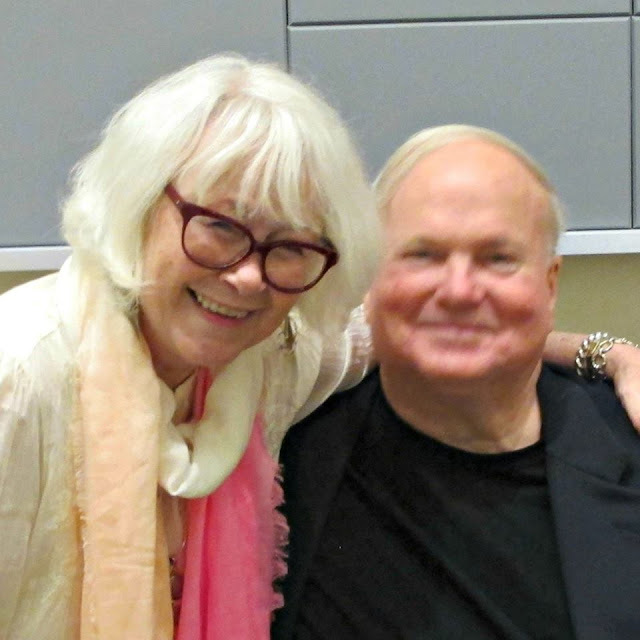 I consider one of my most treasured author meetings to be Pat Conroy. One of my best and oldest friends had read Pat Conroy's Beach Music years ago, and my friend kept telling me I needed to read it. Well, I did, and it remains one of the most powerful, beautifully written stories I've had the pleasure of experiencing. Kaye, I'm so happy that it's your favorite Conroy, and, boy, doesn't it put you through the wringer. Then, oh, about five years ago, Pat Conroy was at the Kentucky Book Festival in Bowling Green, Kentucky, a little over an hour away. I went and was so astounded that this author was as magnificent in person as he was on the page. Kaye, you nailed it when your said that he treats everyone like an old friend. And, your statement about the laughter. This man was a man that inspired laughter, both by his own jolliness and the hilarious storytelling he told when presenting to a room full of people. I have some catching up to do on reading his books, but I'm glad to say that I bought and got many signed at the appearance at which I saw and met him. One of his non-fiction books is a favorite of mine about reading. It's entitled My Ready Life by Pat Conroy, and in it he pays tribute to many who encouraged and influenced him along the way, including his mother and a teacher. His cookbook is supposed to be a riot, but I have it tucked away. Must get it out now. I can not tell you how much this post and video means to me. I loved Pat Conroy. I am from the South and I can tell you Pat Conroy spoke for the true Southern man. His words and emotions were so profound. I spent this weekend reading sections of Mr. Conroy's cookbook and My Reading Life. He was a big man with a big heart. The South has indeed lost a favorite son. Again thanks for today's post and video. Debs - I cannot wait to hear what you think of Beach Music!! and wow - I don't know why I'm amazed at the fact that every one of his books is now on back order, but that just blows me awy. Kathy, thank you. My Reading Life is such a treasure. I love that little book. I think I mentioned this earlier - I was lucky enough to receive an arc of that book and walked around with it clutched in my hands like a kid with a teddy bear. I do have all his books, and all of them have been inscribed and signed by him. Oh, Annette, thank you. We southeners took this death quite hard and very personally, I think.